Maxillary Anterior Aesthetic Reconstruction on Natural Teeth and Dental Implants – A Case Report – Clinician's Choice Dental Products Inc. 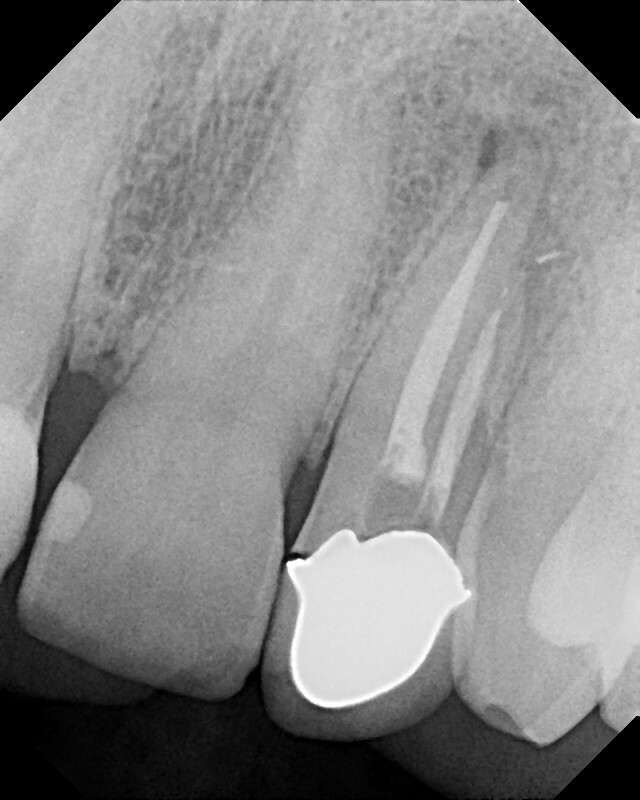 Figure 1: A preoperative periapical radiograph of tooth #10 (22) shows a marginal opening on the mesial aspect and a periapical radiolucency associated with a short root canal fill. It is commonplace to see dental implants as a single tooth replacement option in today’s world of restorative dentistry. 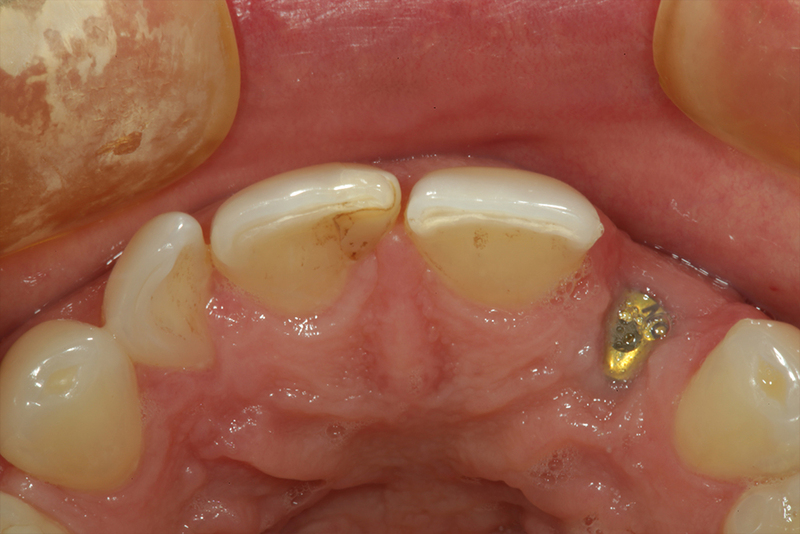 When a patient presents with a broken tooth in the aesthetic zone that is not restorable, the clinical question is whether choose between a conventional fixed bridge or a single tooth implant and crown restoration. Often times the condition of the adjacent teeth must also be involved in the ultimate treatment decision. 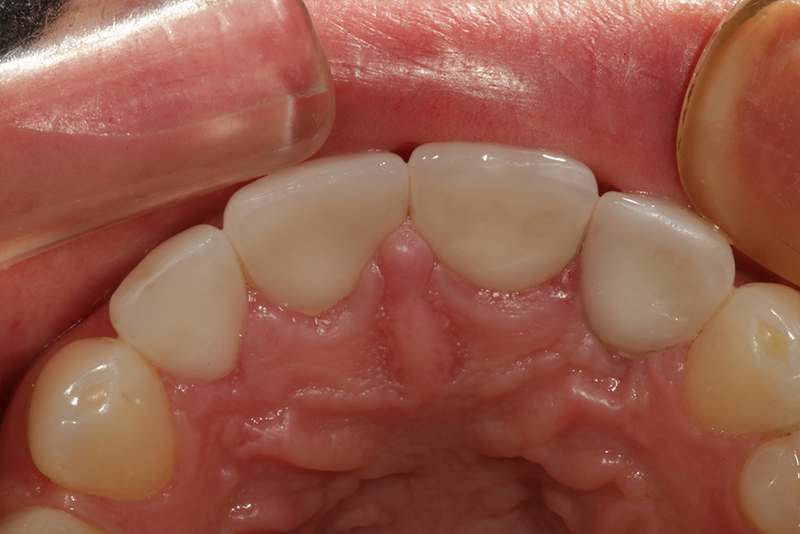 Are the adjacent teeth already restored with direct restorative materials? What is the clinical condition of those restorations? 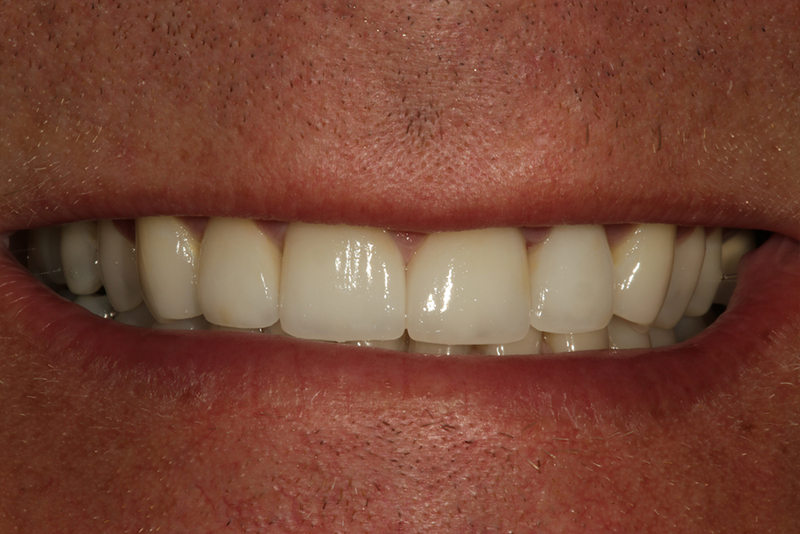 Are the teeth in the immediate area in good position aesthetically and functionally? 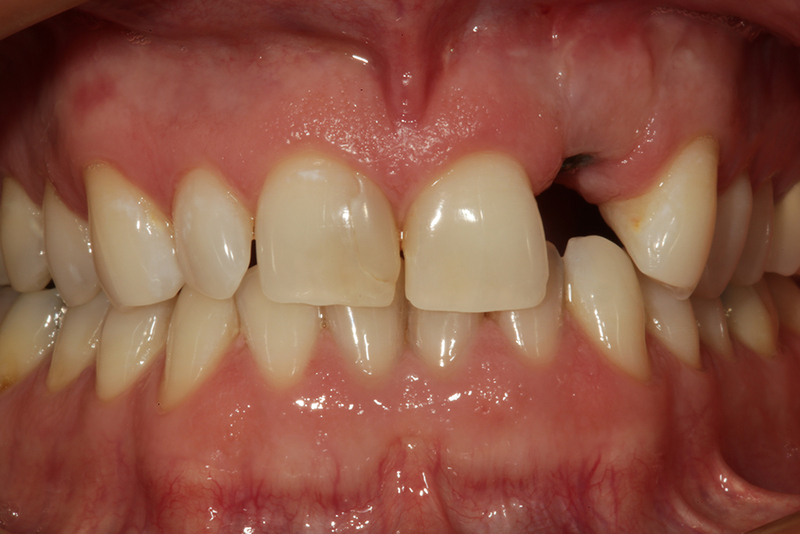 The following is a case report describing a case of a hopeless maxillary lateral incisor that is unrestorable due to root fracture necessitating removal and replacement. 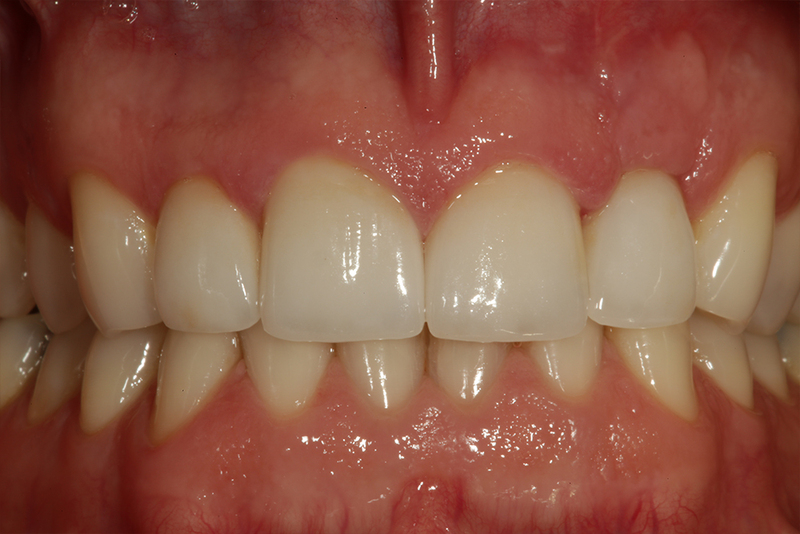 The large, unsightly composite restoration in tooth #8 (11) and the diastema between tooth #’s 8 and 9 (11 and 21). The rotation of tooth #7 (12) toward the mesial aspect. Minor tooth movement (orthodontics) was discussed as a corrective treatment prior to restorative therapy, but the patient was not interested in “braces to fix one tooth”. The overall symmetry of his maxillary incisor teeth (Golden Proportion). It was decided with the patient that to meet all aesthetic and functional goals, the four maxillary incisor teeth would be restored, tooth #10 (22) being a single tooth implant. Another consideration was not to involve the maxillary left cuspid prosthetically, if at all possible, since porcelain over the opposing natural tooth in lateral excursive movement could potentially accelerate the wear of the opposing natural tooth. Figure 4 shows a facial view after soft tissue grafting and placement of an implant in the tooth #10 (22) position. It is important to have an adequate amount of attached gingiva in the edentulous site on the facial surface prior to placement of the implant to avoid potential stripping of soft tissue and bone over time. After about 4 months of healing to ensure osseointegration, a master impression is made to restore tooth #’s 7, 8, 9, and 10 (11, 12, 21, 22). A double cord retraction technique using a #00 cord at the base of the sulcus and #1 cord at the restorative margins are placed around each of the natural teeth and a closed tray impression coping is hand tightened to the implant platform with complete seating verified by radiograph (Figure 5). 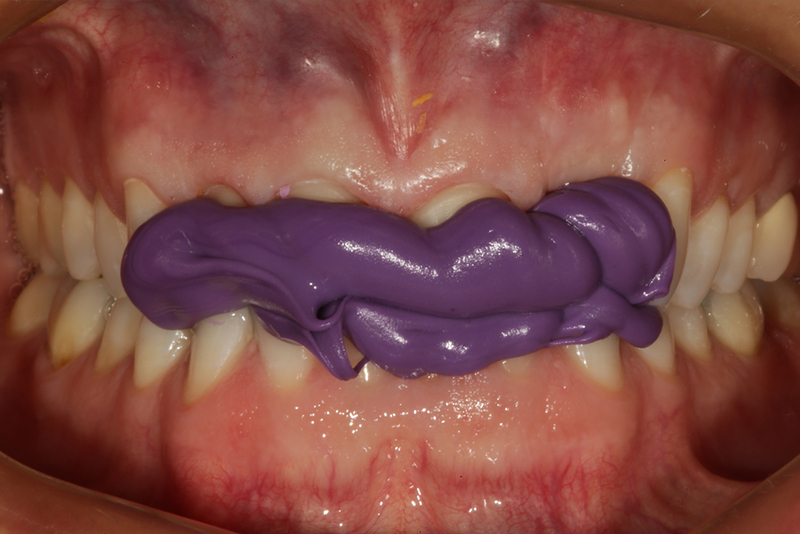 Once the master impression was created (Affinity: Clinician’s Choice) (Figure 6), opposing impressions were also taken using a highly detailed alginate alternative material (CounterFit II: Clinician’s Choice) and a centric check bite was made using a non-brittle, highly carvable bite registration material (Affinity Quick Bite: Clinician’s Choice) (Figure 7). A preoperative provisional stent made with a PVS material (Template: Clinician’s Choice) was chosen due to its ability to capture precise detail, while having an ultra-fast setting time, with the transitional partial denture in place was used in conjunction with a strong and esthetic bis acrylic provisional crown material (Inspire: Clinician’s Choice) to fabricate a provisional restoration for tooth #’s 7, 8, 9, and 10 (11,12, 21, 22) and it was then cemented with resin-optimized provisional cement (Cling2: Clinician’s Choice) (Figure 8). Cling2 contains a unique polycarboxylate resin so it has great retention and is easy to clean up – two very important features of a provisional cement. Figure 9 is a retracted facial view of the provisional restoration after the temporary cement has been cleaned up. Note the corrected tooth positions and gingival zeniths are now in a more symmetrical position when compared to preoperative views. Shade matching is done using a digital camera (Shofu Eyespecial II; Shofu Dental) which has a dedicated isolate shade mode to better help the ceramist see the nuances of hue, value, and chroma in the patients’ natural teeth (Figure 10). At the following visit, the provisional restoration is removed, and the preparations cleaned using a piezo scaler to remove any remaining provisional cement. 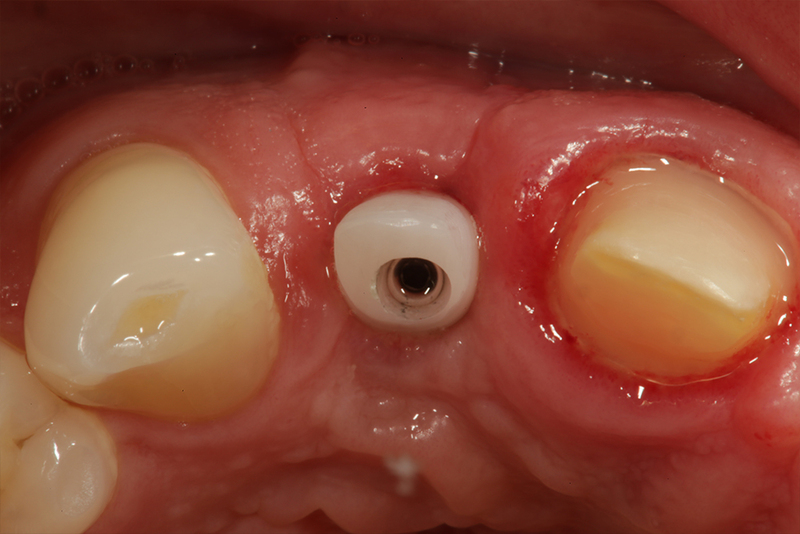 The custom implant abutment for tooth # 10 (22) is placed and torqued to 25 ncm (Figure 11). Click on an image below to enlarge & view caption. Figure 2: An incisal view of the remaining tooth/root after removal of the restorative material in the root canal access cavity. Note the large diameter of the root canal orifice as well as root fractures on the lingual and disto-lingual aspects. Figure 3: An unretracted smile view of the patient after placement of a treatment partial to temporarily restore the # 10 (22) space while an implant is placed. Figure 4: A retracted facial view prior to tooth preparation after osseointegration of the implant in the # 10 (22) site is complete. Figure 5: #’s 00 and 1 retraction cords are placed as well as a closed tray impression abutment on the implant prior to registration of master impressions. Figure 6: A view of the central incisor preparations captured in the master impression. 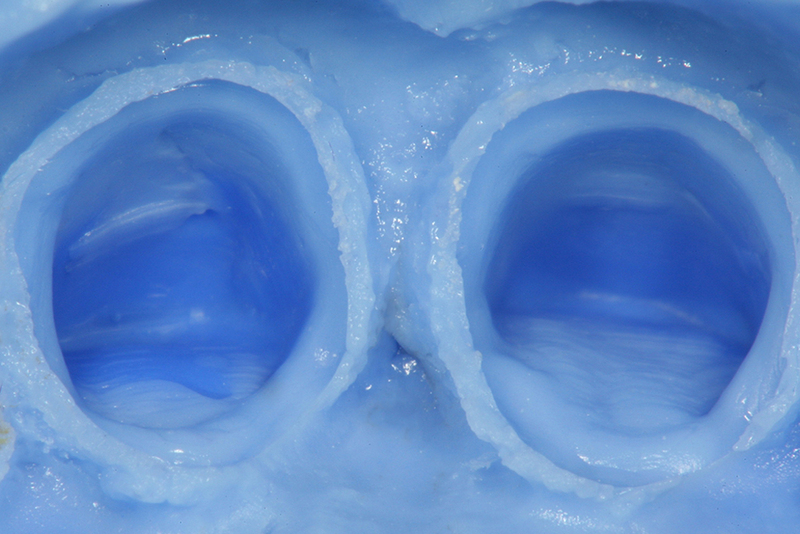 Note that the double cord technique provides an impression of not only the preparation margin, but ½ millimeter of the tooth or root surface apical to the crown margin to ensure optimal fit and emergence profile. Figure 7: A centric bite is taken as well as a facebow registration for mounting the case on a semi-adjustable articulator for fabrication. Figure 8: The provisional restoration is cemented with provisional cement. 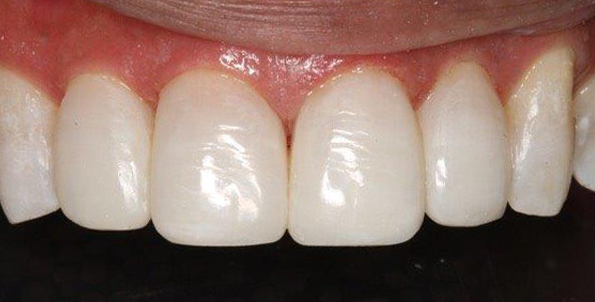 Although this restoration is splinted, the definitive crowns will be individual units. Figure 12 shows the provisional restoration seated on the master dies after cement removal. 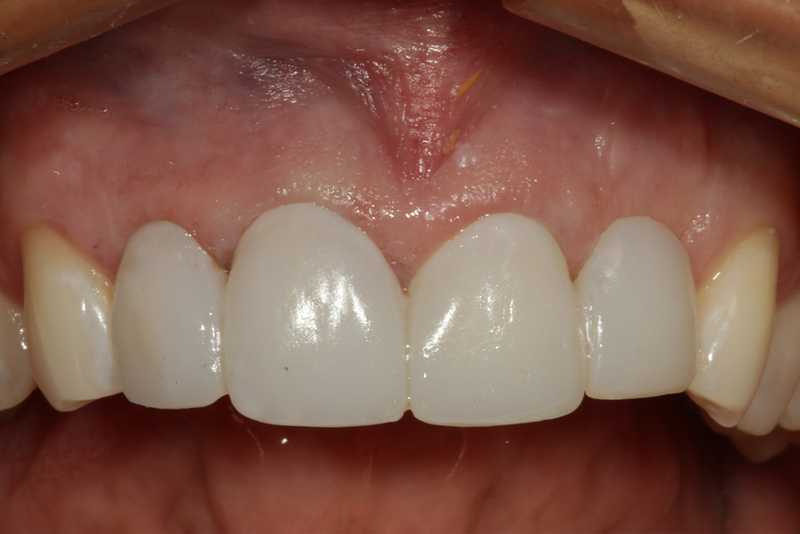 One goal of the provisional restoration is to have physiologic contours to aid in cleansibility and tissue management while the definitive prosthesis is fabricated. When cementing a crown on an implant abutment, care must be taken to avoid excess cement going below the gingival marginal tissues. Since most crowns fit very tightly on custom implant abutments due to the small degree of taper, there can be a lot of hydraulic pressure forcing cement ahead of the crown as it is pushed to place. Care must be taken not to overload the crown with cement! 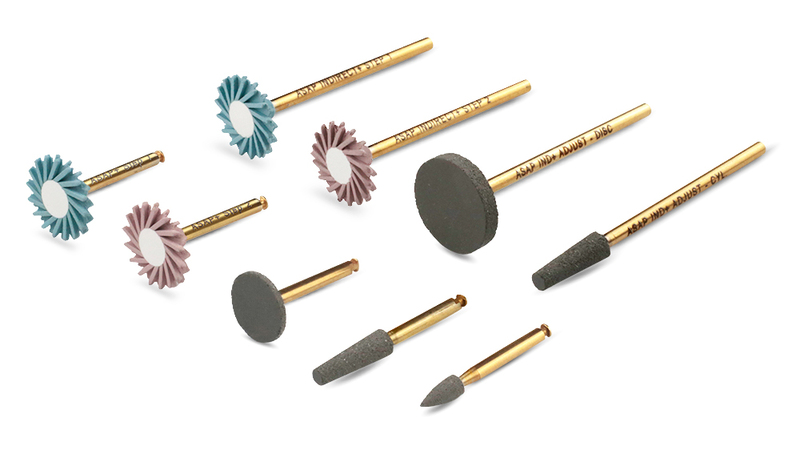 Only a small, thin rim of cement in the apical 2-3 mm is necessary to affect a cement seal at the crown-implant margin. Because of the frictional fit of crowns on implant abutments, it can be deceiving to think these crowns may be retrievable even when placed with “temporary cement.” One way to help ensure a complete seating of an implant crown on the abutment margins is to use a diode laser (Gemini Super Pulsed Diode Laser: Ultradent Products) to “trough” around the abutment getting the gingival tissues out of the way and expose all margins so they are visible (Figures 13 to 15). 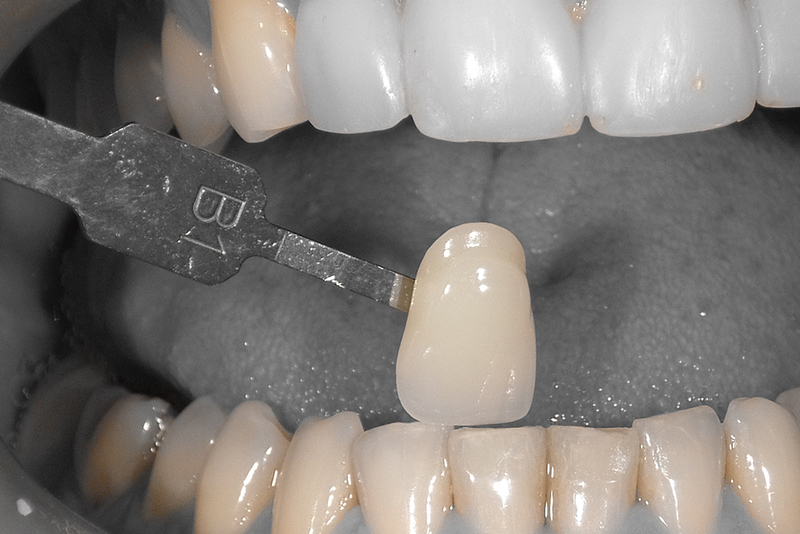 Figure 10: A photo of the shade tab that matches the patient’s natural teeth is taken with a digital camera (EyeSpecial C-II: Shofu) that isolates only the color of the tooth to make shade matching in the lab easier. Figure 11: A facial view of the preparations is shown after placement of the custom implant abutment in the # 10 (22) position. Figure 12: A view of the provisional restoration is shown on the master dies after the cement is cleaned out to demonstrate the marginal fit of the provisional restoration which is crucial to tissue management during the interim phase of treatment. 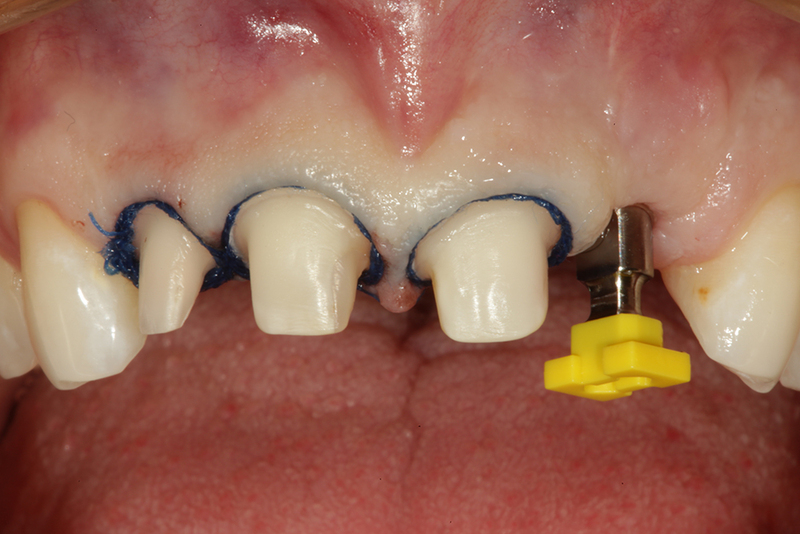 Figure 13: An incisal view of the custom implant abutment after placement. 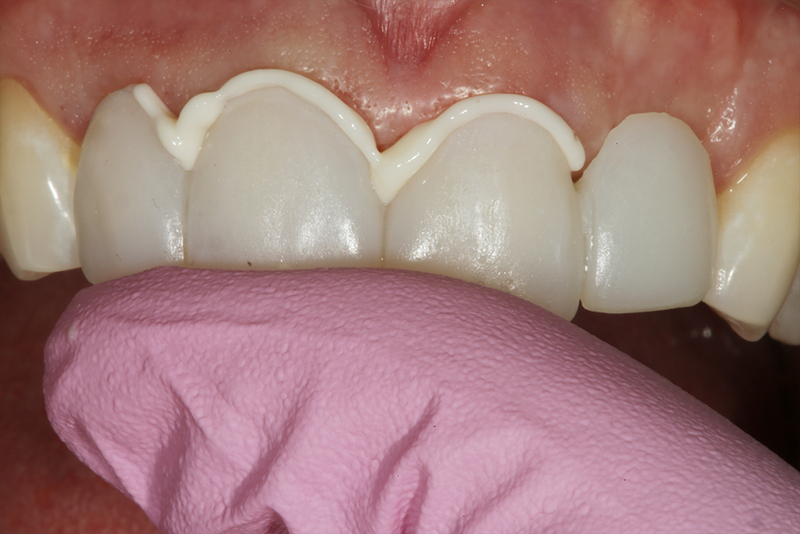 Note how the gingival tissues obscure the restorative margin, which can affect full seating of the restoration. Figure 14: A diode laser (Gemini Super Pulsed Diode Laser: Ultradent Products), which is safe to use around implants, is used to trim the intrasulcular excess tissue and expose the restorative margins. Figure 15: An incisal view of the custom implant abutment showing the exposed margins after diode laser troughing around the abutment. 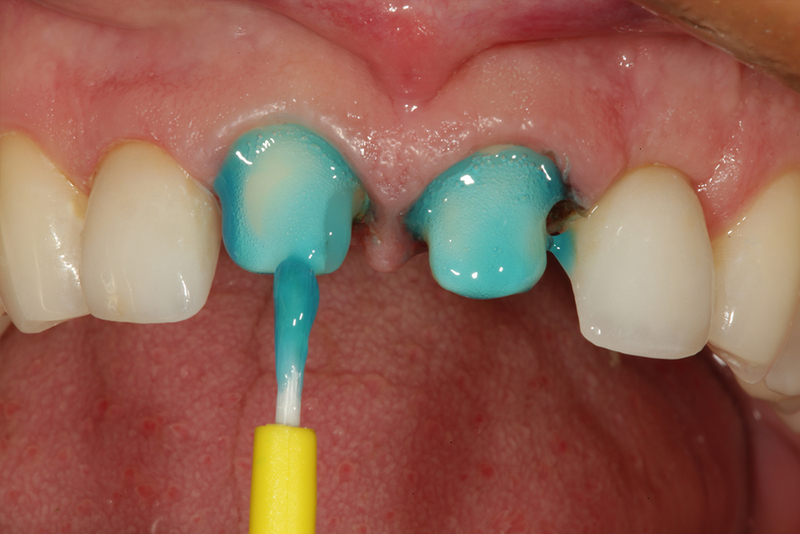 Figure 16: 37% phosphoric acid etch is placed on the maxillary central incisor preparations to ready them for the use of resin cement during final placement. 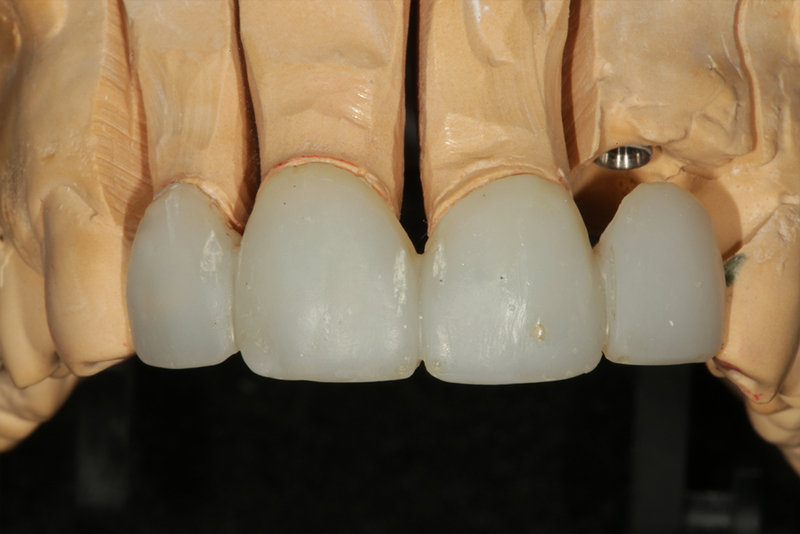 Figure 17: A retracted facial view of the ceramic restorations on tooth #’s 7, 8, 9, and 10 (11, 12, 21, 22) after definitive cementation. 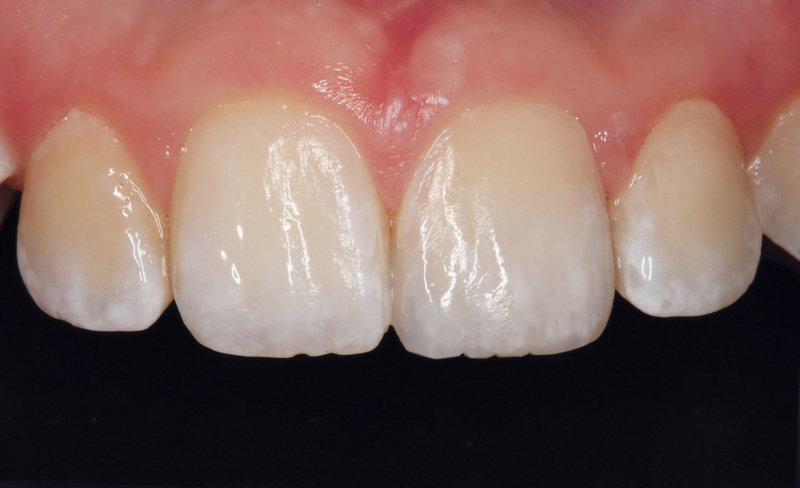 The individual ceramic restorations are then tried in individually to evaluate marginal integrity, then collectively to adjust contacts as needed. The restorations are evaluated with radiography to ensure full seating. Next, occlusion is checked in maximum intercuspation (CO), right and left lateral, and protrusive excursions using ultra-thin articulating paper (Accufilm II: Parkell). 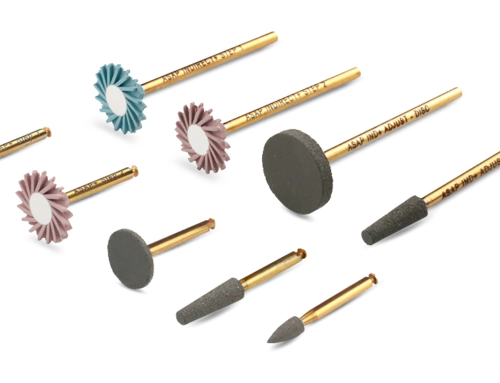 Adjustments are made as needed using fine diamond rotary instruments and the restorations are polished using a highly effective, two-step diamond impregnated flexible wheel polishing system (A.S.A.P Indirect+: Clinician’s Choice) prior to final cementation. In this case, it was decided to cement the maxillary lateral incisors first since # 10 (22) is an implant without a periodontal ligament and will not move. Even though the collective try-in appeared passive, micromovement of the restorations on the preparations can happen prior to cementation giving the illusion of proper fit with interproximal contacts that lightly resist dental floss. Once the maxillary lateral incisors are definitively cemented using total etch technique and resin cement, both maxillary central incisors are retried and verified with radiographs that they are completely seated. 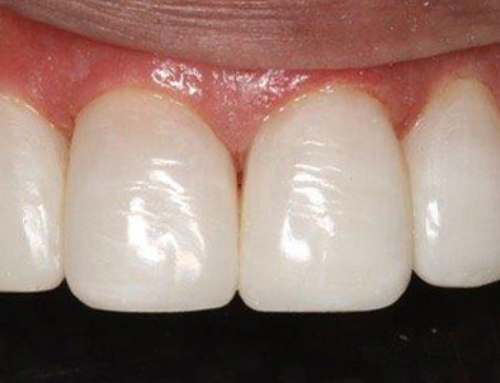 If further minor proximal adjustment is needed for passive fit, it is done prior to cementation. The preparations are etched with 37% phosphoric acid for 15 seconds (Figure 16), then rinsed and thoroughly air dried. An aqueous Gluteraldehyde-based desensitizer (G5: Clinician’s Choice) is applied to the preparations to help obturate open dentinal tubuli, disinfect, and remoisten the dentinal surface. Next, a dentin bonding agent is applied using a microapplicator scrubbing the adhesive into the etched surface of the preparations. The adhesive is then air thinned with the air syringe while at the same time, evaporating the solvent. 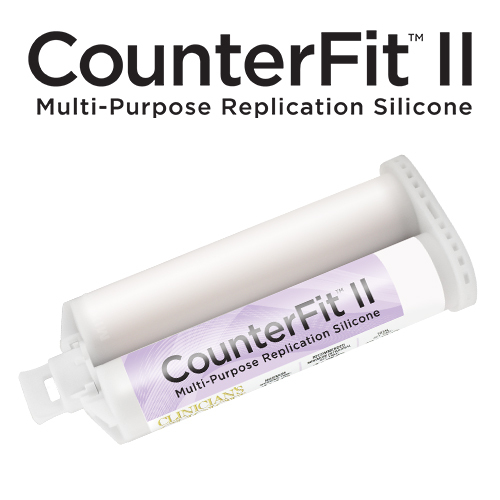 After light curing the adhesive per manufacturer’s instructions the restorations for the maxillary central incisors, which have been presilinated, are filled with resin cement and placed on the preparations to the margins expressing the excess cement. A sable brush and air from the air water syringe can be used to help remove excess cement. 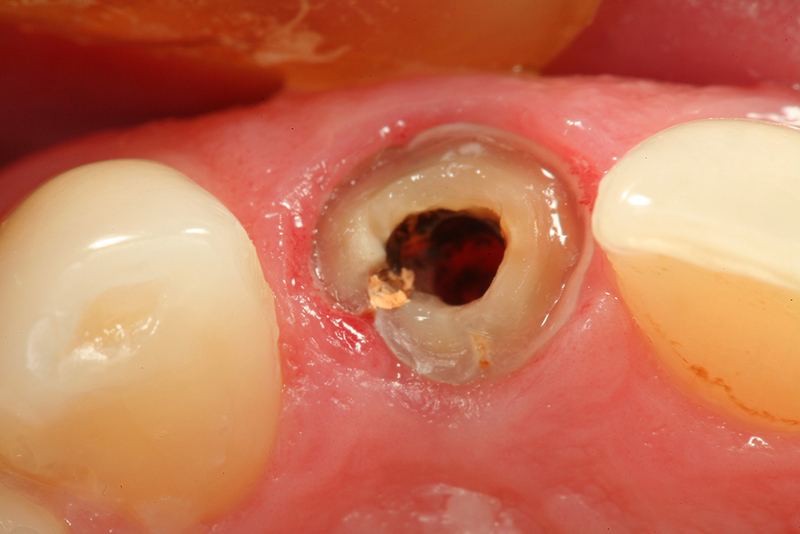 After tack cure, any remaining excess cement is removed, the restorations are flossed between the contacts, and a final full light cure of at least 60 seconds is completed. 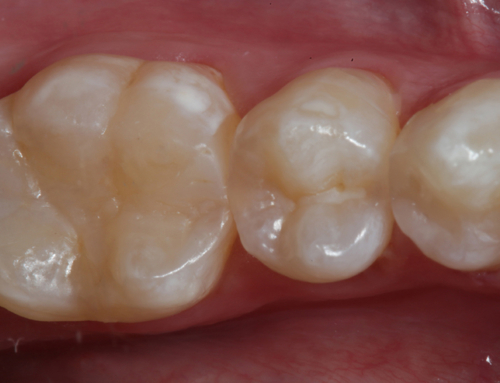 Figure 17 shows the four completed ceramic restorations after definitive cementation and clean up. 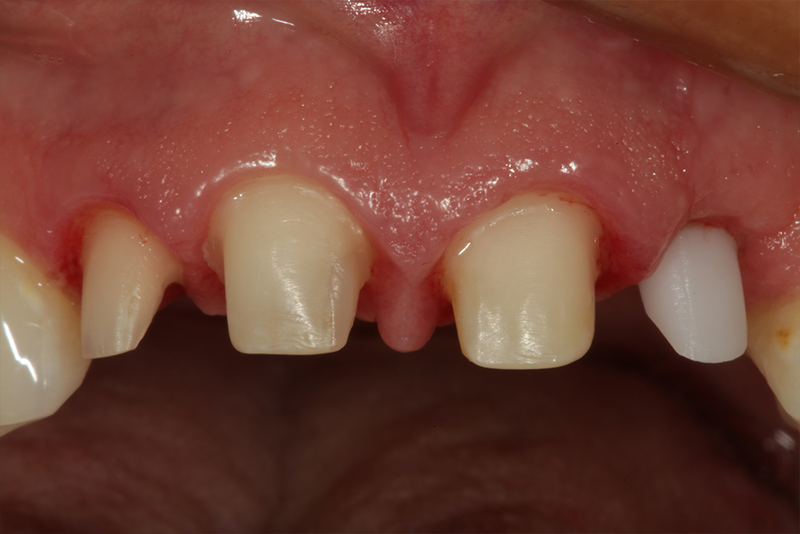 Figures 18 and 19 show a before and after incisal view of the restored area. 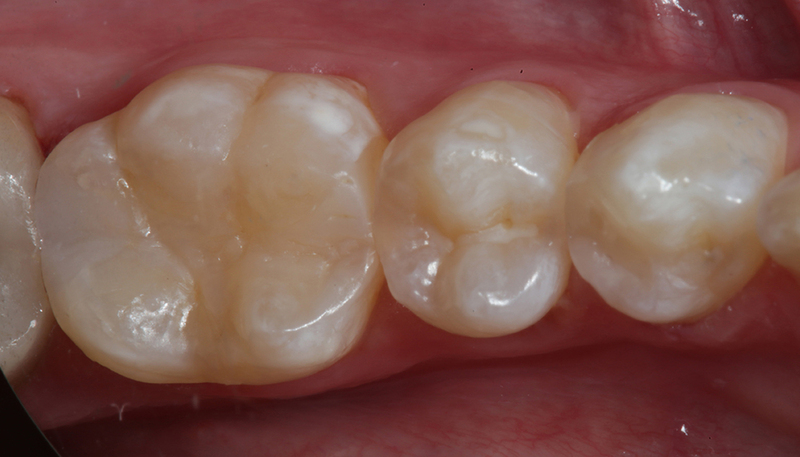 Note that proximal contacts and tooth alignment has been idealized in the restorative materials. A post-operative retracted, and smile views are shown in Figures 20 and 21 respectively. Figure 18: An incisal preoperative view after implant placement and before tooth preparation. Note diastema present and rotation of tooth #7. 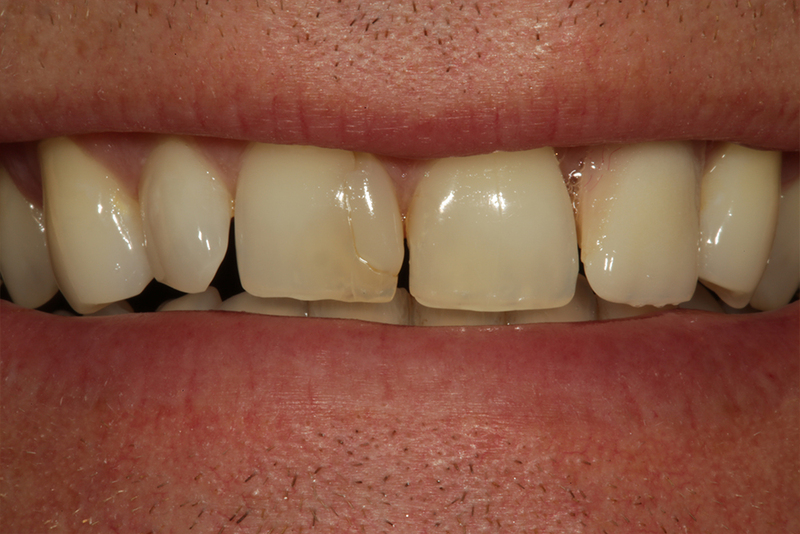 Figure 19: An incisal view after prosthetic correction of tooth #’s 7, 8, 9, 10. (11, 12, 21, 22). Figure 20: A retracted facial 4-week post-operative view is shown. Note symmetrical gingival positions as well as tooth position and cervico-incisal heights. Figure 21: A post-operative smile view. Compare with the preoperative view in Figure 3 to see the nice aesthetic result that was achieved in this case. 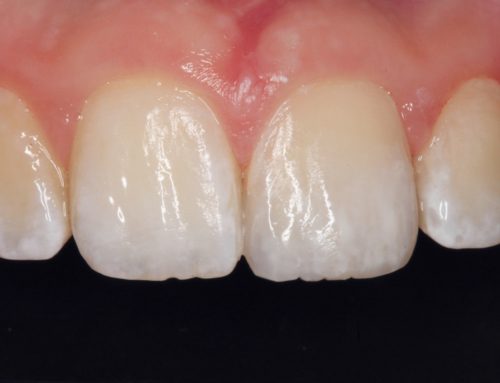 A case has been shown that incorporates a cemented implant ceramic crown with three single-unit ceramic crowns to restore a hopeless tooth in the aesthetic zone. 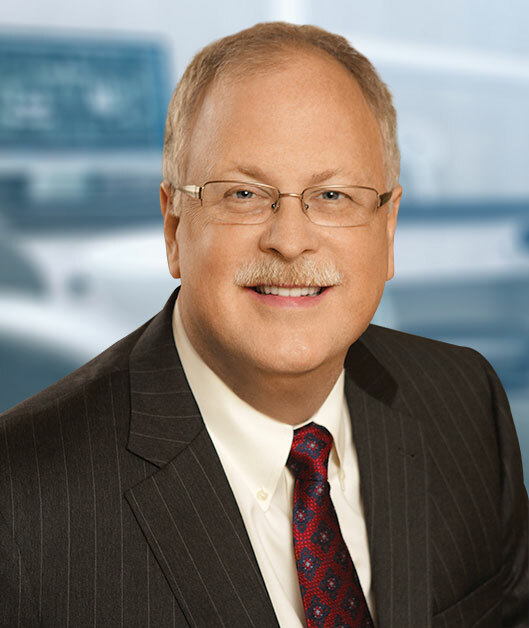 The advantages are clear in using an implant versus three-unit bridge as far as ridge preservation, the patient’s ability to maintain proper hygiene, as well as the superior aesthetics of individual teeth. 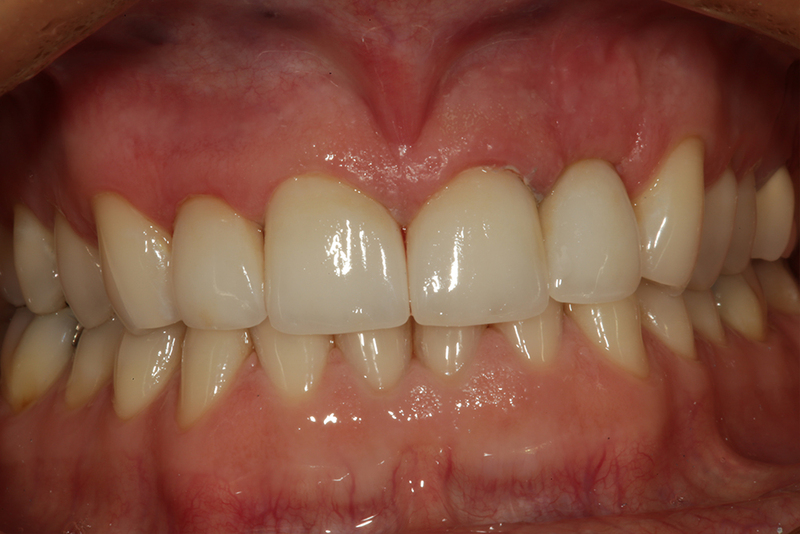 The patient also elected to make corrections on the adjacent maxillary incisor teeth to close spaces, correct rotations, and restore a central with a very large composite in a position that is hard to develop physiologic contours to support soft tissues when using direct restorative materials. This restoration should serve the patients functional and aesthetic needs for years to come!